Recently watched this and it is a strange film - some really wonderful bits overshadowed by the horribly racist depiction of the island tribe. Still - if you can deal with that, there's Meg Ryan doing much more than I've ever seen her do, and a very young Tom Hanks doing his Tom Hanks thing. Some beautiful shots too, esp. on the ocean. Abe Vigoda was the best (plus the tribe having a hebrew bent)! Also, I loved Ossie Davis in this film. This is a cult classic among my friends, I'm totally going to watch it again tonight. "He can get the job, but can he do the job?" Oh that fluorescent lighting in the office! Love this one. Was NOT expecting it to be an EbertFest pick, but it was the first one we saw there that first year. I don't remember anything about the talkback with the cinematographer (was that the guy? Can't remember...) but it was so beautiful to watch those moonlit scenes on the big screen. I love Angelica, the snotty one. For once Meg Ryan isn't just trying to be cute. He can get the job, but can he do the job? I'm not arguing that with you! I love this movie and want to quote it all the time, especially when eating crustaceans, but I don't think anyone will ever know what I'm talking about. I saw it over and over running on local TV on the weekends and it finally just dug in really deep. For such a silly movie there's a lot of odd recurrent motifs - losing your sole/soul; the lightning pattern; the tribal volcano god is the factory where Joe worked. Also: Abe Vigoda is in it as the tribe leader and I was NOT expecting that! Joe, gazing down at Los Angeles: "It looks fake. I like it!" I love this movie with all my heart. Me: Are you feeling ok? Me: Did you get a second opinion? That movie is so damn quotable! It is a dream of mine to go to New York City and stay at the Pierre. Also, to travel with steamer trunks. Also known as the "the only Tom Hanks movie I can deal with." Maybe because there is no smugness, only bewilderment. And Meg Ryan doing more than wrinkling her nose is nice also. But yes I love this movie. I often think about getting a hula lamp for my cubicle. Meg Ryan actually impressed me and I kind of wish her career took a different trajectory than "cute haircut". The luggage salesman may be the first time I had scene a fully formed twee worldview expressed on the screen. Still one of my favorite movie characters of all time. This is one of my favorite scenes ever. "Have you thought much about luggage, Mr. Banks?" "... an ocean voyage. Very exciting, as a luggage problem"
"I'll take four of 'em"
"May you live to be a thousand years old, sir"
Daddy always said I was a flibbertigibbet. I've actually done web searches trying to find that darned violin case portable bar. No luck yet. I love this movie. So the Islanders are all dead? I guess that's ok as long as Patricia and Joe are alright. Not my definition of an enjoyable, uplifting movie. If the volcano god is real, he rejected Hanks and killed his own people. If the volcano god isn't real then Hanks' god saved him again (he prayed while on the steamer trunks) and killed/allowed the Islanders to die--presumably because the Islanders didn't worship Hanks' god. I find this movie disturbing/problematic on a number of levels. Who said anything about uplifting? I've always seen it as pretty dark. The whole plot is a terminally ill man going to commit suicide. If there's going to be humor in something like that, it's going to be dark. Well, you have a number or issues here. First, just because they were saved doesn't mean Joe's god, or any god necessarily exists in the movie universe. 2nd, I've always interpreted the volcano's rejection of Joe as meaning that he violated the requirement that someone jump into it of their own free will; so that he was reluctant to do it in some way, probably because of what had happened to him over the course of the movie. Seems like that would be a pretty important point, yes? 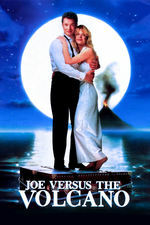 At that point, whether Joe jumps in the volcano or not, either way, the island is destroyed and your moral issue resolves itself. This could work; it also specified one person as opposed to two. I thought this was a lot of fun and very interesting from an artistic/aesthetic standpoint. I enjoyed the hell out of the visuals. ...would you like to hear it again?" I'm glad I gave this a rewatch. Such a fun movie. Very 80's. THE UNLOVED, PART FOURTEEN: "JOE VS. THE VOLANO"
One day, around 2001 or so, I stayed home on my day off, got really drunk, and watched this movie twice. My wife came home, saw me on the couch and exclaimed "Damn, dude, did you do anything today?" I then hopped off the couch, hit play on the VCR, and showed her how I learned the little dance that he does while floating in the ocean.